One of my favorite websites in the world is diapers.com. The site is fun, offers free (and super quick) shipping, and almost everything under the sun that a parent could possibly want or need for their child and parenting needs. Their slogan is “We deliver everything but the baby.” Indeed they do. I am also a fan of their email. Here is a recent email I received from Diapers.com. They have a view online link in the header text. The header image has useful links, the company name, slogan, and a shop link. The main body image has my name dynamically populated, has a shop now button, and has links to six products. These products are based on the age of my child. This data, I assume, was collected when I signed up for email with diapers.com and when I purchased various age specific products. The footer text is also well done. There are social media links, a forward to a friend option, a clear disclaimer, a notification of who sent the email, a message making sure the email is age-appropriate for my child (this is a super big plus!! ), and the standard unsubscribe and CAN-SPAM content. Also, in this email, I discovered the diapers.com has a new twist on a common email feature. The HTML and TEXT version of their emails have the common "This message contains graphics. If you do not see the graphics, click here to view." feature which opens a hosted version of the HTML email. Most email marketing programs simply display the hosted version of the email and stop here when this link is clicked. Not diapers.com. The hosted version then contains this message in the header: "If you are still having problems viewing this message, please click here for additional help." When this link is selected a web page displays. This helpful site helps the subscriber understand and troubleshoot common image rendering issues. This is nice for those subscribers who for whatever reason cannot figure out how to display images. Diapers.com did not give up on these subscribers once the hosted version displayed. Nice job diapers.com. Keep up the good work. Great Post, truly the right way to market via email. Thanks Chris. 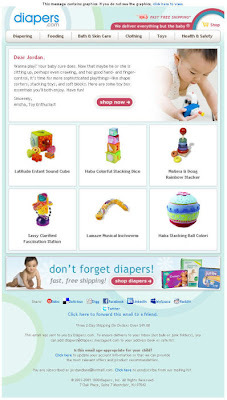 I hope Diapers.com continues to create great e-mails and that others learn from them. Thanks so much for the wonderful feedback! We've spend a lot of time thinking about how to get relevant information to our customers in an engaging, easy-to-use format. We want to make sure that we're meeting all of a new parent's needs and that we make their lives just a little bit easier. We really appreciate the praise! How Obvious Is Your Registration Link?